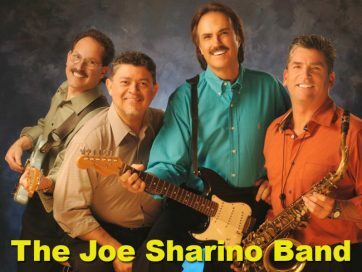 The Joe Sharino Band is the number one versatile entertainment choice for Corporate Events, Conventions, Fundraisers, Festivals, Wedding Receptions or any other party or event! Although they are well known in Northern California's Bay Area in places like San Francisco, San Jose, Santa Cruz, Napa, Yosemite, Monterey and Carmel, they perform all over the United States and always earn rave reviews. The Band can be especially tailored for your Event in its original dynamic 4-piece Act or you can option for their fantastic 5-piece (+ female vocalist) or their ultra-incredible 8-piece Sharino Allstars package depending on your preference! The Joe Sharino Band has performed at over 550 wedding receptions and they are the most sought after wedding dance band in Northern California. The Joe Sharino Band's extensive variety of music makes it easy to please everyone! Joe is happy to consult with each Bride and Groom to help make the event flow exactly they way expect it to! The Joe Sharino Band has appeared at concerts and corporate events all over the U.S. and has also performed at numerous High Profile Fairs & Festivals all over the West Coast as well.